At the end of The Atomic Cafe the filmmakers include a credit thanking Emile de Antonio, perhaps America’s most important compilation filmmaker (1). Compilation films stand somewhere between documentary and experimental film; pioneered by such Soviet filmmakers as Esfir Shub and Dziga Vertov, they are commonly constructed almost exclusively out of material retrieved from archives – newsreels, training films, home movies and other sources of “live” footage. The common purpose is to remove archive materials from their original context in order to achieve a reinterpretation of the events depicted. The recontextualisation that is thus achieved often depends on the “dialectic collision between the inherent perspective of the original archive and its radical re-use” (2). Paul Arthur argues it is “radical” because the filmmaker reinterprets images in order to invert conventional meanings and to effect a “politicized activation of suppressed ideas” (3). From Shub to de Antonio, one can draw a line all the way to another “scavenger” of “dead” footage; the assemblage artist and filmmaker, Bruce Conner. 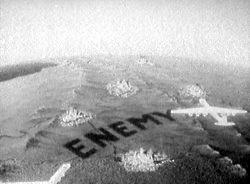 His experimental film, A Movie (1958), created out of scavenged materials and cut together as “a rapid bombardment of images”, is believed by many to have spearheaded the deployment of a range of editing techniques that later influenced such films as Easy Rider (Dennis Hopper, 1969) and foreshadowed everything that MTV would subsequently pioneer (4). According to J. Hoberman, it is Conner’s spirit (5) – or maybe his collaged image of a mushroom cloud sticking out of a man’s uniform – that rightly hovers over the critically acclaimed The Atomic Cafe (6). The Atomic Cafe is directed by Kevin Rafferty, Jamie Loader and Pierce Rafferty, and is a black comedy about the harrowing misinformation surrounding the government’s acquisition, development and testing of both the atomic and hydrogen bombs. Edited by Jayne Loader and Kevin Rafferty, the film is an “artfully assembled collage of official insanity” (7), pulled from an extensive archive of propaganda films originally made to pacify the American public by demystifying the effects of nuclear fallout. According to Jamie Loader, it was Pierce Rafferty who stumbled upon the catalogue of “3433 U.S. government films” in a San Francisco bookstore – as early as 1976 – and then came up with the idea to make a film about these propaganda films (8). Titus Costandina traces the archives the filmmakers unearthed to such U.S. agencies as the Atomic Energy Commission, the Federal Civil Defense Administration and the U.S. Armed Forces. Apart from the objective and educational purposes behind such government films as The Magic of the Atom (1954), other films like Duck and Cover (1951) were made to “reassure the people that they could be safe in a nuclear attack, that the strong and ready would survive” (9). By piecing together all these archive materials the filmmakers take us on a journey so outrageous and hilarious that it could only have been made possible through propaganda. The Atomic Cafe starts off with the atomic explosion that marks the Trinity Test, and which prepares the way for the bombs dropped over Hiroshima and Nagasaki in 1945. The film weaves transitions without the use of any voiceover narration; rather, it tunes in and out of radios and television programs, lyrically interweaving scenes together through associative editing. One such edit cuts from what looks like the lens of a Navy periscope to the square tube of a television screen that is inside an American household. The association invites us to consider the notion of being watched, subliminally reinforcing the filmmaker’s view that the government cannot be trusted. Such edits carry the audience through the key moments and events that structure the rising fear of communism, coming to a peak with the beginning of the Korean War in 1950, and President Truman’s threat to use the atomic bomb once again. The commentary of a cartoon sequence – showing a tiny man being boxed in by different hands – included in the film states: “when people are confused they will listen to any voice that can diagnose their trouble and prescribe a cure”. What sounds like an introduction to communism segues into footage of President Eisenhower being elected into office. The insinuation that America is ruled by dictators is implied when Eisenhower’s speech about America’s god-given prosperity overlaps with a montage illustrating the evolution of consumption – from tube tooth-paste to frozen dinners. This brilliant sequence aptly stages the United States’ entire argument for the atomic bomb as its only defence against a Soviet threat to whipped cream. As in Oliver Stone’s JFK (1991), President Eisenhower again warns the public about the “transfer of power from the mere musket and little canon all the way to the hydrogen bomb in a single lifetime”, ostensibly arguing how the advances in science have outflanked the emotional and intellectual capacities of most Americans. But spoken truths seem helpless against the exhaustive barrage of visual misinformation The Atomic Cafe throws at its viewer. This merely illustrates the film’s brilliance for throwing out didactic “truth” in order to highlight the irony and cynicism required to produce “counter-propaganda”, bypassing “filters” in order to engage ideology (10). The filmmakers’ decision to do away with voiceover narration – preferring to let the audio-visual material to “speak for itself” – only came after wasting the better part of five years gathering stock footage for the film their sponsors wanted (11). The unstaged or vérité moments the film privileges are intimated by the inclusion of such candid moments as President Truman caught grinning before the news cameras prior to giving a sullen speech about the atomic bomb. Such “flashes of truth” or “moments caught live” – such as footage showing the difficulty a man has pronouncing “stethoscope” while announcing Ethel Rosenbaum’s execution – are incompatible with the idea of government as an infallible institution that is beyond reproach. However, in The Atomic Cafe such an ideological perspective or point-of-view only communicates a loftiness on the part of the filmmakers. Therefore, rather than disrupting the connection between cinema and its ideological function, the ideology underlying The Atomic Cafe suffers from a “superiority complex” which emanates from the ideological position’s inability to criticise itself (12). In the light of such overt politics – or the filmmaker’s selective selection and editing of archival materials – various writers have further criticised The Atomic Cafe by pointing out the filmmakers were “preaching to the converted” (13), and those defined as “leftish, leaning towards jaded and punk” (14). On another level, Fred Glass criticises The Atomic Cafe for squandering its opportunities to offer some images of hope (15). But perhaps the reason the film denies “the people” any dimension other than the fact of their gullibility has more to do with The Atomic Café‘s subtraction of the people from its ideological equation – the inherent flaw of all Marxist doctrines. However, in defence of the filmmakers, one needs to appreciate the fact that the poignancy of the materials they have gathered resides in the issue and status of the atomic bomb itself, which, unlike other issues, has made a 180 degree turn in the last 50 years. One can possibly refer to what they unearthed as the “Zapruder film” of the atomic age, shot by the “assassins” themselves. Once one has distinguished, as does the entire philosophical tradition, between truth and reality, it immediately follows that the truth ‘declares itself in a structure of fiction’. Lacan insists a great deal on the opposition truth/reality, which he advances as a paradox. This opposition, which is as orthodox as can be, facilitates the passage of the truth through fiction (16). By compiling propaganda or fictions denying “nuclear-truth”, The Atomic Cafe reveals the American public’s lack of resistance to the fear generated by government propaganda films and the misinformation they generated. Whether Americans of the time lacked the ability to resist or reject this misinformation about the atomic bomb is a debatable truth. In her review of the film, Deirdre Boyle points out another obvious truth that is facilitated through these fictions: the unawareness of the filmmakers to the fact that The Atomic Cafe is itself propaganda (17). Stella Bruzzi, New Documentary: A Critical Introduction, Routledge, New York, 2000, p. 23. Paul Arthur, “On the Virtues and Limitations of Collage”, Documentary Box 11, January 1998, p. 2. Kristine McKenna, “Bruce Conner in the Cultural Breach”, The Los Angeles Times, 10 June 1990. Bruce Conner, “Bombhead”, Magnolia Editions. J. Hoberman, “Ain’t Nothin’ like the Real Thing”, American Film 8.4, January-February 1983, p. 19. David Ansen, “Bomb Scares”, Newsweek, June 28 1982, p. 73. Jamie Loader, “Up Close and Personal”, Public Shelter. Constadina Titus, “Back to Ground Zero: Old Footage through New Lenses”, Journal of Popular Film and Culture 11.1, Spring 1983, p. 3. Jean-Luc Comolli and Jean Narboni, “Cinema/Ideology/Criticism”, Film Theory and Criticisms: Introductory Readings, ed. Leo Braudy and Marshall Cohen, OUP, New York, 1999, p. 726. Fred Glass, “The Atomic Cafe”, Film Quarterly 34.3, Spring 1983, p. 54. Jacques Derrida, “Le Facteur de la Verite”, The Post Card: From Socrates to Freud and Beyond, The University of Chicago Press, Chicago, 1987, pp. 467–8. Deirdre Boyle, “The Atomic Cafe”, Cineaste 12.2, 1982, p. 39. Bunmi Oloruntoba is currently completing a M.F.A in scriptwriting at Regent University, Virginia Beach. He lies awake at night wondering why kamikaze pilots wore helmets.